← Meatless Monday Is Sproutabulous!!! Ok home cooks & foodies, we will prepare a classic Greek dish. I love Greek food, and a couple of my favorite meals to eat on the go are a Greek Gyro and Soulvaki. These quick meals are pretty popular here in NYC and we have food carts all over the place selling these treats. But enter one of New York’s Greek restaurants and you will encounter a variety of very good dishes from Greece such as Αρνι με Πατατες στο Φουρνο (roast lamb with potatoes); απάκι, which is a famous Cretan specialty of lean pork marinated in vinegar, then smoked with aromatic herbs and shrubs, and packed in salt; Χταποδι στη σχαρα (grilled octopus in vinegar, oil and oregano); and the dish I will prepare tonight: μουσακάς 0r moussaka. I must admit that prior to this experiment I had never tasted this dish. But after talking to my friend Rena, who lives in Athens, Greece, and she has a website called “Cooking in Plain Greek” (which I love), she gave me the all the motivation I needed. We will use the recipe from her site for this classic Greek dish. 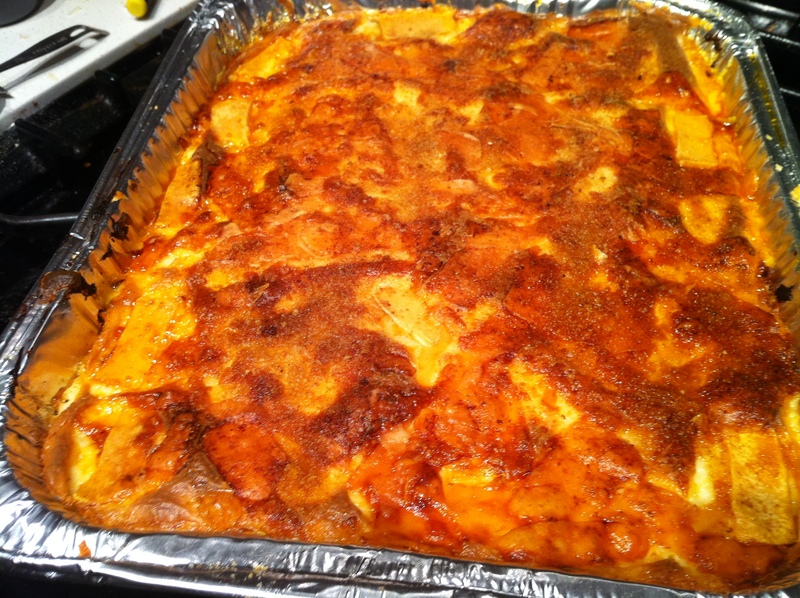 The first thing I noticed is that this dish is prepared similar to lasagna but the flavors are different. Instead of using pasta for layers, you use long eggplant slices, and I used ground lamb instead of beef. Another thing that makes it different than lasagna is the spice mix. This dish contains nutmeg, cinnamon, and allspice, which is unheard of when making Italian lasagna. You also must make a Greek bechamel sauce to top the dish with before baking, which consists of milk, flour, butter, and kefalotyri cheese. Unfortunately, I could not find this specialty hard cheese, but Rena gives us a pass and recommends parmesan for those of us outside of Greece :). 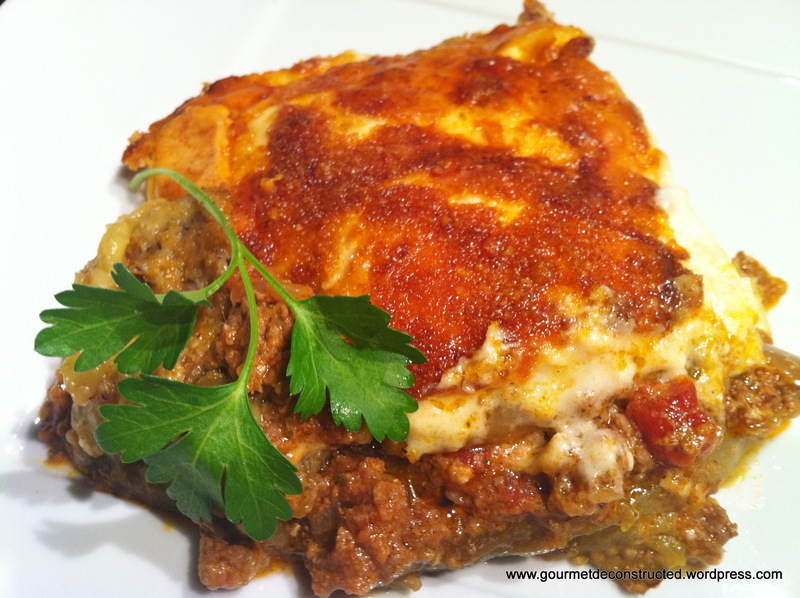 If you haven’t tried cooking Greek food, head over to http://cookinginplaingreek.com/traditional-moussaka-recipe/ and try your hand at this dish. Bon Appetit! Posted on January 29, 2012, in Lamb and tagged bechemel sauce, eggplants, greek food, ground lamb, tomatoes. Bookmark the permalink. 8 Comments. I love moussaka. Thanks for the inspiration! chef, i loved your site, and i am following you already. I am a chef and i live and work in Brazil. Thank you for the amazing recipes. Looks great and would love to experience these flavors. I checked the site and saved the recipe.